When the veil thins and the spiritual world comes close to the land of the living, creatures from the beyond can occasionally break through to explore our world once more. Ghosts haunt and even clacking skeletons manage to crawl their way from their graves to plink around and see what they’ve been missing. The thing is that the thinning veil doesn’t really give us mortals any indications of what is going on. Only the especially sentitive or lucky ever manage to notice that anything is evening happening beyond the general sense of spooky. It’s just not right! So, our team in the lab have put together some tech that helps even the odds for the rest of us. 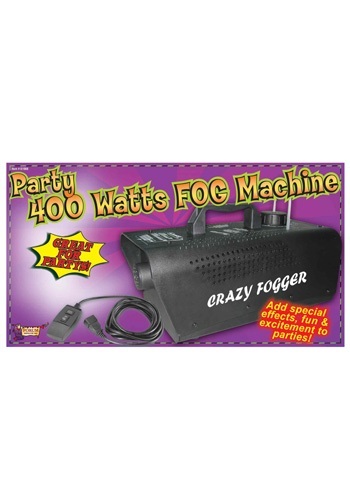 This 400W Fog Machine might look like it is just the perfect tool to give your dining room, dance hall, or graveyard scene the right atmosphere for all your mysterious endeavors… but it will also reveal where those breaches of the veil can be found. Creating 2,000 cubic feet of fog per minute, you’ll never be surprised by an approaching ghost again… though they will look especially spooky with all the fog moving around. We think that’s a bonus, though! Be sure to pick up some extra fog liquid to ensure you’re ready the entire holiday.